Without horse, she didn’t survive, with a truck with my personal stuff I managed to come in Quwayra, a non touristic village on the Desert Highway, north of Aqaba. Emotional broken, psychologically a wreck, physically very fragile, weighing not even 50 kilos with a length of 1.80 meter. But so happy I managed. 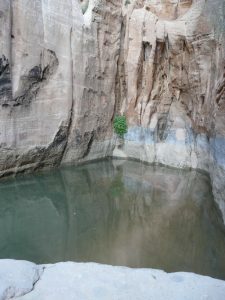 Although with the help of the Embassy of the Netherlands who understood the importance and danger I was in, in Petra. The welcome was so warm in Ahmad’s home. They took me by my hand to the grandparents who life on the same courtyard. Immediately the grandmother took my hand and ordered me to sit next to her. She kept my hand repeating habibti, habibti, habibti. Meaning my love. The grandfather was looking at us with tears in his eyes. Without telling anything they knew what had happened. I was full of stress since long. I used my last strength to take all my stuff and to leave everything behind to not look back anytime again. Anxious about life, people, but I was safe. I came into a strong Bedouin family, they would protect me. Their first warning was not to leave the courtyard. In Jordan the law is different. A husband can come to take his runaway wife to take her home again. I didn’t matter, I was in a safe place, the courtyard was big. They had a small room for me and I put most of my stuff inside to make it comfortable. It was the second of January, winter in Jordan. All asked me to dress up for winter but I came from such a cold area without love that I only felt the warmth of a loving family The house was full with kids, all of them came in a different way to me to show their love. They didn’t want me to do anything, but I insisted to help in the kitchen and in the home, as I could not concetrate to do anything extra on the laptop. My salvation was a young puppy, a Saluki, Warda. I started to pet her and to take care for her. She came just a few days before me, too young. We became friends, a dog is the best friend if you have to recover. With her I went to the courtyard in the evening when the kids were sleeping and the place was empty. Except the goats who were in their own space. With their funny heads and penetrating eyes. Before I left to Petra it was on this courtyard that I showed my horse to the family. The grandmother chose her name, Samiha. Back here I could mourn about her. I missed her, she would have loved it to be in this place again. Soon I would be on a horse again. Someone would come for a horse riding tour of five days in March. Alone, as she had started to ride horseback in her fifties. This was a dream for her, a challenge to proof that she could do this. I accepted her to make a private tour. Ahmad and me went to Wadi Rum, to meet his friend Abdullah. The one who is always organizing our tours in the desert. 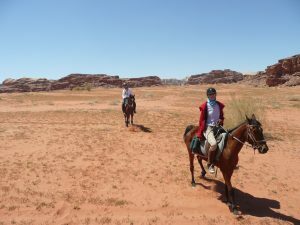 He would take care to rent horses from Petra as he didn’t have horses yet. Only the knowledge that the horses would come from Petra with someone to groom them gave me the creeps. But I had to go through those encounters to become strong again. I was looking forward to ride on a horse again. Our guest arrived, I had invited someone else to join us who was already in Jordan. Who loves horses and horse riding as she told me and as I could see on her pictures. We went to take the horses after their arrival from the truck. Ahmad and Abdullah were there to help. From the road we went to the camp, where we would stay another day. The three of us on a horse. The horse of the one I had invited, let’s call her Claire was so excited to see the sand that he wanted to roll. Claire could step off easily. Ahmad wispered in my ears that she could not ride so well as she had explained to me. I kept this saying with me with hesitation to accept. We would see. I gave more instructions to form a group and how to deal with those horses who were also new for me. They guy from Petra gave me the big stallion as a leader. He was kind and nice to ride on. Did everything wht I asked him. My focus was on the guest, how she would go as she was excited and a bit anxious in the same time. We gave her the mare. After lunch we went for a longer tour to get known to the horses well. In advance I told them to stay in line behind me. First the next stallion, the mare in the back. I made sure the riders heard and understood this order. Claire didn’t follow up and I saw her coming to ride next to me. Always I look at the whole combination, how is the horse dealing with the rider and vice versa. But this time something strange happened. I saw the eyes of Claire. She was not Claire at that moment. Her eyes were in a kind of trance, as if she was hypnotized or wanted to hypnotize me. A pale shine came from her eyes as you see in cartoons, it took me just a second to understand what she was doing. You don’t expect those things in real time. Immediately I feld the horses were not at ease anymore. I turned my horse back from her, he still accepted my orders but was not relaxed. The mare with the guest, although a bit further made a jump. The guest fell off and lay on the ground. Her horse gone. I jumped off my horse to run to her with his reigns in my hand. I was able to take the mare who didn’t know where to go by her reigns. Shouting to Claire to move from us. But instead she came closer, very well knowing what she was doing as still her eyes were so strange. I will never forget those eyes. Her horse was again next to me. He wanted to kick my horse, instead the mare wanted to bite him but by accident she bite in my arm. I left the horses free, knowing they were too excited now. Before I did I shouted to Claire to come down. But she didn’t. Safety of the guests is first in every tour. I had to choose between two worse scenarios and I let the horses free knowing that Claire didn’t step off. But I had to see the guest who was still lying on the ground. Noticing the other horses, the horse of Claire also wanted to join them. Only at that moment she jumped from her horse. She was prepared to fall and it seemed she went well. The horses went immidiately, running and jumping to discharge their energy far away. My guest seemed very shocked. After I asked her how she was I asked her to move her limbs one by one. It seemed good. She could move. The following car came by with the three men. They wanted to take her to the hospital. But she said she was fine. Then I dared to ask if she wanted to ride on a horse again. A possitive answer. But she needed time. I gave her a massage of her back before she stood up. Meanwhile an eye on Claire who still was on the ground. She had asked the man to bring her bag from the car. Inside she had a first aid kit with needles for accupuncture. She was studying to become an accupuncturist. As she knew I know the points as well she asked me to put the needles. But I refused as I was too confused what was happening with her. Beside something inside me gave me instruction not to do this. She put the needles herself, we were just looking at her because she didn’t answer our questions. Only then I took off my pullover to have a look at my wound. When the Bedouin Ahmad and Abdullah saw this they couldn’t believe. Abdullah tol me I’m a real Bedouin. Wounded in the fight and first take care of the others. It was a big wound, the teeth prints of the horses very clear vissible and bleeding. We cleaned it as we always have a first aid kit as well for people as well for horses with us. They dressed my wound and brought us back to the camp. The men found back the horses and brought them back. The 2 women didn’t want to ride this day. I asked Claire to just sit on a horse after her jumping of as she didn’t tell us she wanted to continue or not. She did, although a bit scared but at least she was on a horseback that we kept by hand. 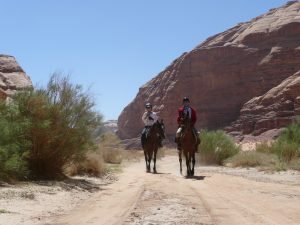 I decided that the man from Petra and me would take the two stallions to canter with them through the desert to loose some energy. In my eyes they were perfect to ride but just in case to have them calm for the next day. It was a perfect ride. The horses and us were enjoying the moment. Every step they made was a good one. They didn’t think about what happened before. My guest and me started the next morning together with the horse boy as Claire din’t want to ride. Abdullah whispered in my ear that she didn’t have anything but just was not able to ride as well as she had spoken before. I insist her to stay with us to enjoy the rest of the tour in the car with her dog she took on the trip. Also because I wanted to see how she went. She didn’t want to visit a doctor. Later after the trip she told us that her ribs were broken, that she went some time after the trip to the hospital for X-ray. We’re having our hesitations about this story as she stayed three more days with us, knowing that we may not judge anyone. Having safety always on the first place as well for the people as well for the horses. 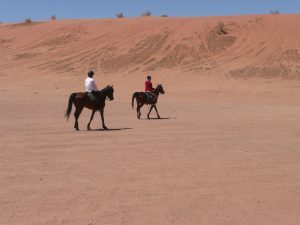 The guest enjoyed the tour much, her dream came through to ride a tour in the desert. She rode the quiet stallion while I took the mare as we had a special connection while the man took the stallion he wanted me to ride on. The last afternoon of the tour, after lunch, she went on her horse again. But after five minutes she told me she wanted to ride in the car. My eyes were frowning, why? She did so well and she realy liked the tour. She told me she was so convinced she made it. But she was a little scared that something would happen in the last part of the tour. She made up her mind that she was complete satisfied with what she had done. I was so proud of her to know herself so well. If a horse feels you’re a bit scared he will act likewise. She went in the car, saw ather nice parts of the desert where the Bedouin took her to enjoy her last part of the desert scenery. 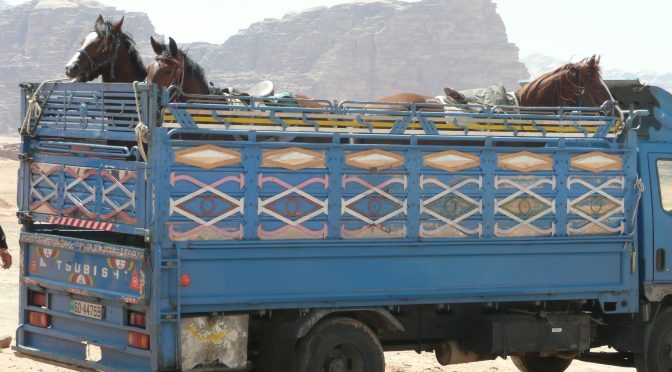 While we, the man from Petra, the three horses and me could go fully cantering, trotting and walking the last part to where the truck was waiting to bring the horses home. 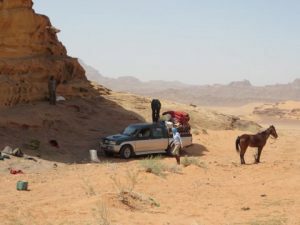 If you like to know where I am now and what I do, visit our website Jordan Desert Journeys. Or connect to me on facebook. 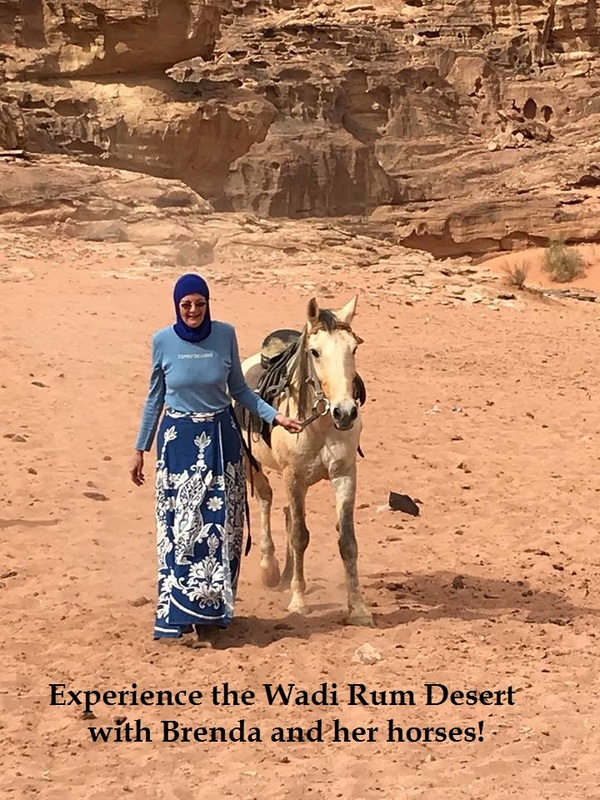 I’m writing a book now about my desert life in Jordan. With many more stories, check it on the fb page: Een leven in de woestijn. 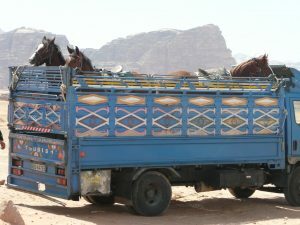 Next time a blog about my move to live in the desert of Wadi Rum with horses again.